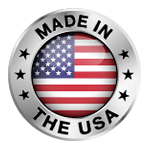 Acme Vial and glass has proudly manufactured vials here in the United States of over 70 years. In 1942 Charles V. Knowles decided to start a little business manufacturing and selling glass vial out of his California garage. Three generations later we are still family owned and operated and committed to providing our customers with superior customer service, top quality vials and competitive prices. Acme Vial currently operates out of a large, modern facility in Paso Robles and has become a well-respected manufacturer of tubular glass vials worldwide. Custom orders are welcome. If you are looking for a vial that is not within our stock product line we have the capabilities to custom manufacture vials to fit your specific needs. We can help you design a vial to your specifications and then manufacture in small or large quantities. Capabilities include the forming of tubular glass vials with the following finishes: shell (fire polish), screw thread, crimp, patent lip and display. Stock tubing options range from 7.75mm to 29mm outer diameter. Length capabilities range from 19mm to 203mm. 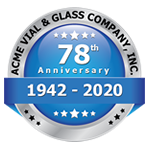 Acme Vial and Glass is committed to providing quality products on time that meet or exceed customer expectations and comply with all requirements. Acme Vial and Glass will ensure success through the adherence to an effective quality management system based on continual improvement and customer satisfaction.